Most restaurants close at 10 p.m., she wrote. Nonfunctioning traffic lights sit curled up on street corners, twisted and uprooted from their cement bases. Many streets lack street signs. Schools, health care providers, restaurants and groceries are absent in many parts of the city. Many of his clients, said Mr. Bricker, were residents of New Orleans' public housing projects, evacuated from low-rise brick apartment buildings now shut down by the Department of Housing and Urban Development, which plans to raze the units and replace them with mixed-income homes. "With minor repairs," said Mr. Bricker of the barricaded projects, "poor people could move back in there tomorrow." 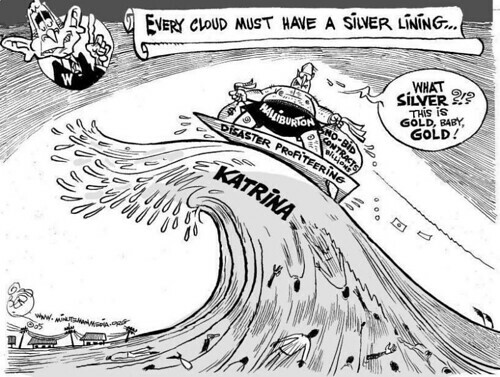 Pity the soul that makes cash off of Katrina!